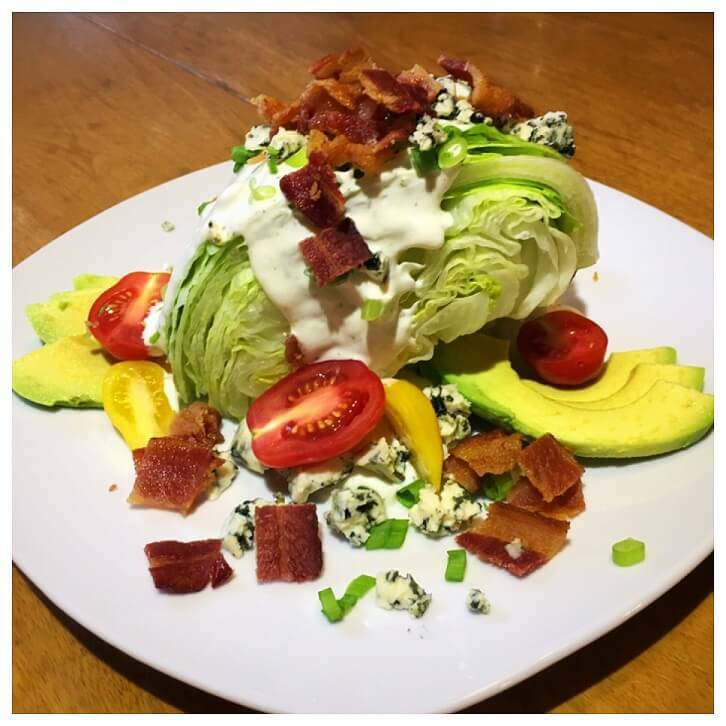 The Wedge Salad is and American Steakhouse Classic. So hearty, it is usually served with a steak knife, this salad matches the crispness of Iceberg lettuce with a cool and creamy Ranch dressing. This salad has bacon as the star, so it is a perfect fit for No Name Brand Hickory Smoked Thick Cut Bacon. Adding bacon into the made-from-scratch Ranch dressing is such a delicious variation, you will find yourself making the dressing for dips, spreads or sauces. Don’t have time to make the dressing from scratch? Crumbled No Name Brand Bacon can spice up any store-bought Ranch dressing and take it from bland to gourmet. Enjoy this salad as an impressive first course or an entrée. Prepare 10 slices (one package) of No Name Hickory Smoked Thick Cut Bacon on the stove or oven according to package instructions. After bacon is cooked, drain on paper towels and cool. Crumble the bacon and reserve ½ Cup of the crumbles for the dressing. Remaining bacon will be used for topping the salads. Combine all dressing ingredients and allow to sit for at least 30 minutes before serving. Place a wedges of Iceberg lettuce on plates. Top with a generous helping of the Bacon-Buttermilk Ranch Dressing. Sprinkle with Blue Cheese Crumbles, tomatoes and green onions. Arrange a few slices of fresh avocado on each plate. Crumble cooked, No Name Hickory Smoked Thick Cut Bacon on top of the salads. Serve with a steak knife and Enjoy! Cooking for a crowd? Make this recipe into a layered salad instead: Cut Iceberg lettuce into bite sized pieces and arrange in a serving dish. Layer the ingredients over the top and serve! HINT: Soak your cut Iceberg lettuce in ice water for 10 minutes and drain well on a kitchen towel before serving. This will ensure that your lettuce is extra crunchy!